The Newton's Parakeet (Psittacula exsul) was a parrot endemic to the forests of the island of Rodrigues, a dependency of Mauritius, in the Indian Ocean. It was about 40 cm (16 in) long and mostly a slate grey colour, which is unusual for a Psittacula, generally a genus of mostly green parrots. The species epithet exsul, "exiled", refers to the refugee François Leguat, who gave the first testimony of the bird. The last living bird was seen in 1875. Only two complete specimens and various subfossil bones survive. Only two complete specimens, one male and one female, survive and they are both in the Cambridge University Museum. The female specimen was sent by Sir Edward Newton, a colonial administrator in Mauritius, to his brother Alfred Newton, who officially described the bird in 1872. Mr Vandorous shot the male specimen in 1875, which is thought to be a juvenile from its beak colouration and from the lack of a red patch on the shoulder of its wings. There are also various subfossil bones. Newton's Parakeet was 40 cm (16 in) long, about half of the length being the length of its tail feathers. Its general appearance was similar to the extant Psittacula species, and it had the black collar characteristic of its genus; however, it differed by its slate blue, not green, plumage. 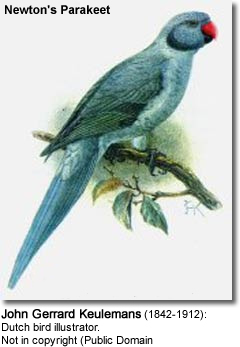 The specimens show it had a yellow iris, was a darker grey blue on its upper surfaces than lower surfaces, and the male had a dark line on its face running from its cere to its eyes, which was less prominent in the female. The female had a greyer head, and the females black collar was not so prominent as the male's, and did not extend to the back of the neck. Early travellers reported parrots having a red patch on the shoulders of their wings, a feature which in not seen on either of the two surviving complete specimens, leading to speculation the male specimen is in juvenile plumage. 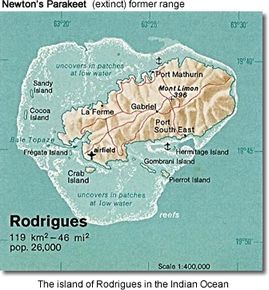 The early reports suggest that green birds also existed; whether there were two color morphs, or the green coloration was borne by recently-fledged birds, or whether at one time a short-lived colony of a related green species existed on Rodrigues cannot now be determined. It was first recorded by François Leguat, who was the leader of a group of eight French Huguenots who colonised the island or Rodrigues from 1691 to 1693. He said that the parrot was abundant and reported that they ate mainly on the nuts of an olive-like tree. He said that they were good to eat and able to imitate speech. One was tamed by them spoke French and Flemish (Dutch). They took it with them when they finally left the island for Mauritius. Another description is found in the traveller's report Relation de l'Île Rodrigue, which was written by Julien Tafforet in 1726. It was next mentioned by the French mathematician Alexandre Pingré, who travelled to Rodrigues in 1761 to view the transit of Venus. He noted that the bird had become scarce. The species' extinction was presumably caused by a combination of habitat loss and hunting.